You Are Listening To "By The Time I Get To Phoenix"
Phoenix is located on the upper edge of the Sonoran Desert. In the 130 years of its existence, Phoenix has grown by 2.7 million people. 12 million folks visit Phoenix every year. Camelback Mountain provides a dramatic backdrop for Phoenix in the Valley of the Sun. 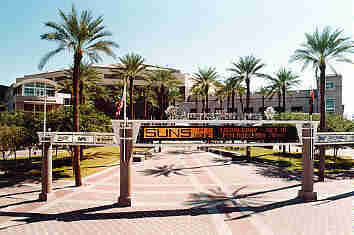 This is the new America West Arena, home of the Phoenix Suns. There's biking and trail riding on South Mountain. We're off again for a very mysterious place. 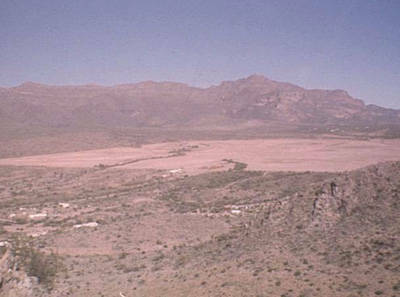 The Superstition Mountain has long been the source of stories and tales about lost gold. 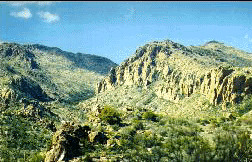 Legends of the Dutchman's Lost Gold Mine and many others still attract people from far and wide to this rugged mountain range east of Apache Junction. Superstition Mountain rises 3000 feet above the surrounding desert floor, and dominates the eastern fringe of the Salt River Valley. Superstition Mountain and the Dutchman's Lost Gold Mine are almost synonymous with lost mine lore. Does it really exist? It is rumored a German prospector by the name of Jacob Waltz struck a bonanza gold ore vein and braved the dangers of marauding Apaches prior to the 1886 surrender of Geronimo at Skeleton Canyon. 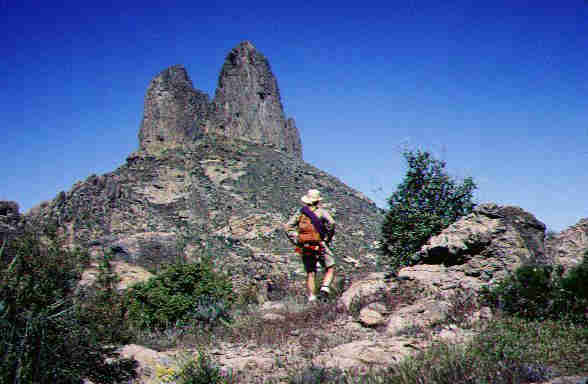 Many maps have been found (or drawn) always making reference to Weaver's Needle, a prominent pinnacle which towers over much of the region east of Superstition Mountain. So, did the mine exist? It's never been found, but to this day, people are still searching. 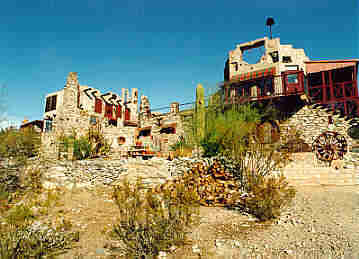 This is the ghosttown of Goldfield which sits just at the base of Superstition Mountain. We'll drive back into the city now and have a look at the Arizona State Capitol Building. 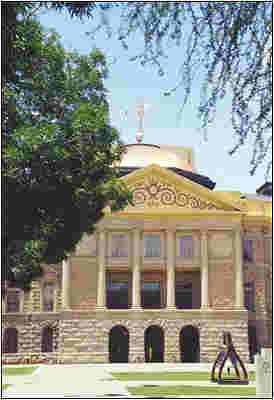 The outside of the Capitol Building is constructed of stone native to Arizona. 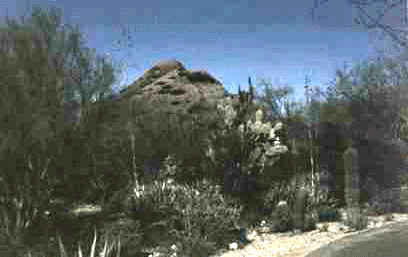 The foundation is malapai rock taken from Camelback Mountain. The first floor is granite from South Mountains. The second, third and fourth floors are tuff stone quarried in Yavapai County. The changing desert winds keep the Winged Victory wind vane atop the Capitol Dome busy. Fifteen tons of Arizona copper top the dome. That's the equivalent of 4,800,000 pennies! 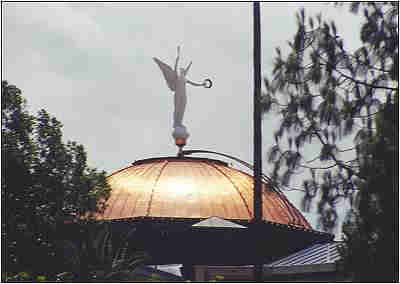 Built in 1899, this building served as the territorial capitol until statehood in 1912. This part of the building is now a museum. 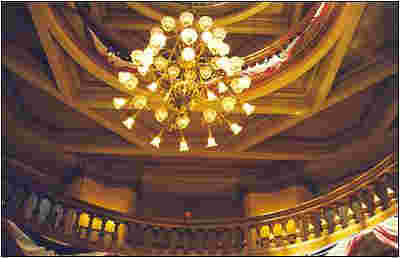 The Capitol boasts a four-story rotunda. 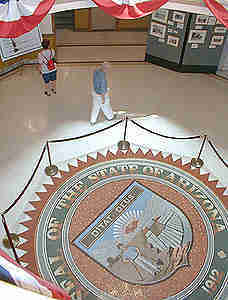 The Great Seal of Arizona, set in mosaic tiles, welcomes visitors to the rotunda. 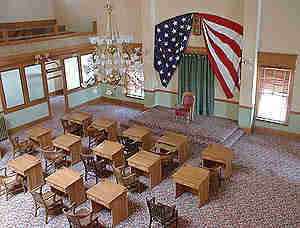 Arizona's first House of Representatives Chamber has been replicated to the 1912 original. Almost looks like a school room, doesn't it? 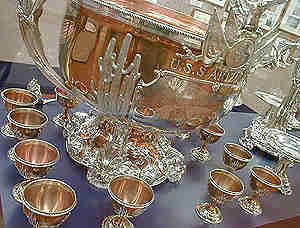 Silver artifacts once stored aboard the battleship, U.S.S. 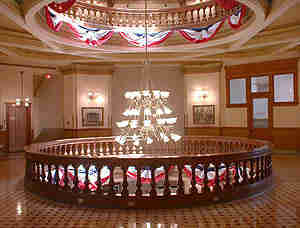 Arizona, are displayed in the Capitol Museum. This was a nice visit, but I'll bet Phoenix has even more to offer. Let's go see. Here we are at the Desert Botanical Garden. The purpose of this garden is to conserve, study and disseminate knowledge of arid-land plants, particularly those in the southwestern United States. 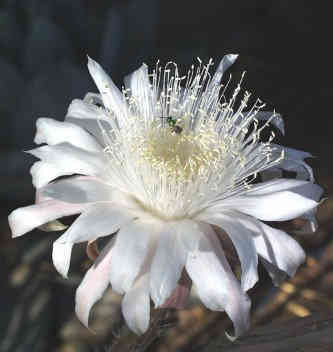 This beauty is called the Arizona Queen of the Night. Logically, it is a night bloomer. Let's just stroll around the garden. 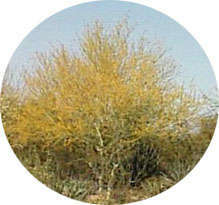 Once again, here is Arizona's State Tree, the Palo Verde. This one is in full bloom. 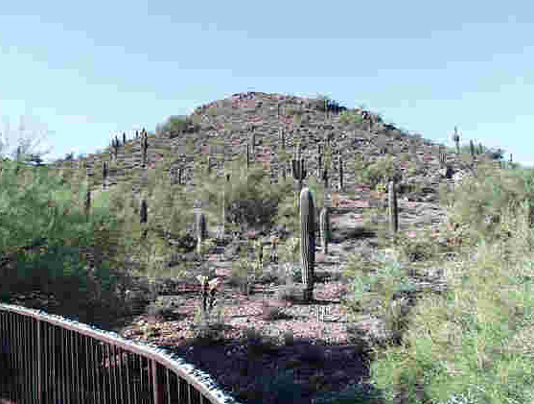 The total naturalness of the Desert Botanical Garden is what gives it its remarkable beauty. Walking through these gardens is walking through the desert. There are almost 450 varieties of the Aloe Vera plant. They vary in size from 6" to a multi-branched tree. It has long been known for its healing qualities, especially for burns. 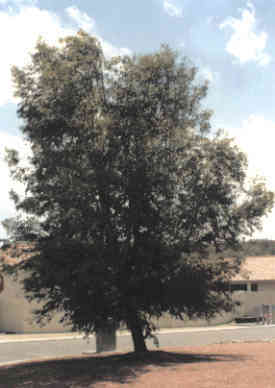 Velvet Mesquite is native to the southwestern United States. It is usually a small tree about 25 feet tall. However, they vary in size from a low, scrubby tree to 50 feet tall. 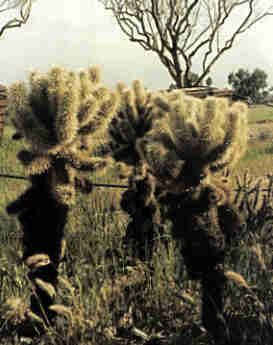 The Cholla (pronounced CHOY-ya) is generally a fairly small cactus, but has been known to grow up to five feet tall. 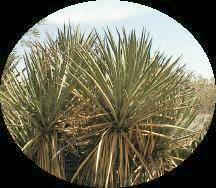 They are silver-green in color and very easy to spot in the desert. The majestic Saguaro can be seen throughout the southwest. This fellow is probably about 150 years old. 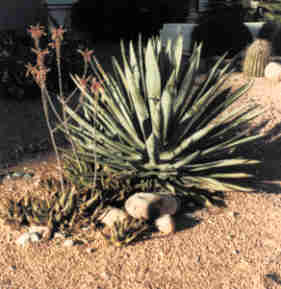 The Banana Yucca is found in the desert and other arid environments. Its leaves are long and sharply pointed (take my word for this.) Waxy white flowers appear in the spring. 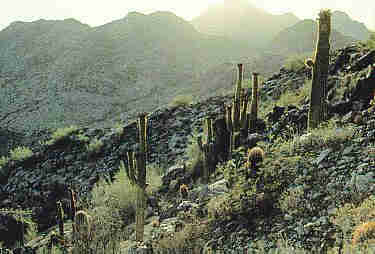 It is easy to see where the Organ Pipe Cactus got its name. 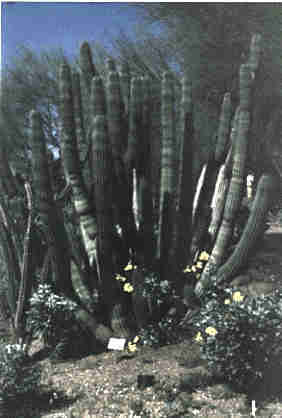 They grow in the Sonoran Desert in Arizona and Mexico. They have pale pink flowers and produce an edible fruit, as do many cacti. Isn't this a wonderful place? The air conditioning is going full blast in the Chevy, so let's all pile back in there and see what's next.